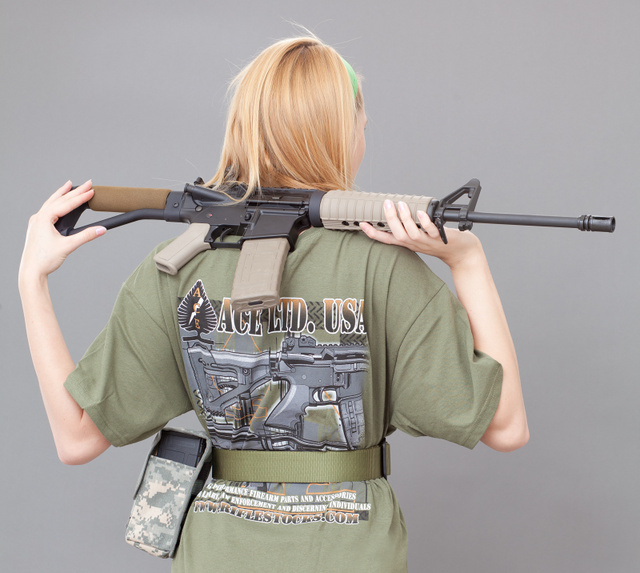 Standard A2 AR15 is much too long and heavy for many new shooters, especially teenagers and smaller-statured women. The wonderful modularity of AR rifles means all these problems can be addressed. I had this rifle built specifically for training newbies. Flat top means that I can add a red dot to help shooters who are cross-eye dominant. Light tone was picked so that the rifle wouldn’t heat up in the sun. 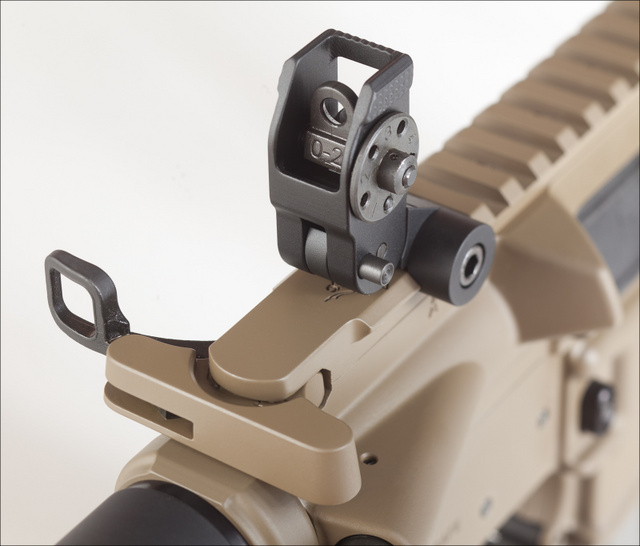 Short length of pull fixed stock and fixed front sight were both picked for strength, the large sling adapter on the front also acts as the support hand protector. 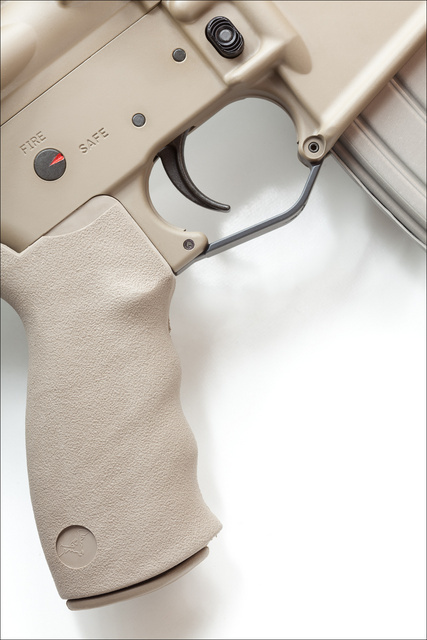 Light profile barrel limits sustained fire capability, but most hunting or self-defense situations are resolved in fewer than 60-80 rounds this barrel can fire rapidly without overheating. This rifle makes a good candidate for a .22 conversion kit for the youngest shooters. And speaking of .22 conversions, here’s DSC patrol carbine with CMMG .22 kit. This entry was posted in rifle, training and tagged 223, AR15, BUIS, Doublestar, fiber optic, rail, tan, teens, women. Bookmark the permalink. Wow, my ex-wife would love that. Short armed, cross eye dominant. She always had problems with my non-red dotted rifles. Maybe I will email this to her. Mr. Volk, Would you please elaborate on the cross-eyed dominant training? All three of my kids are cross-eye dominant, so I’ve been having them shoot left-handed (with my rightie arms.) They all write right-handed, for instance, but seem to prefer shooting leftie. Ideas? Red dots allow shooting with both eyes open and usually the weak eye can see through the sight sand the strong eye look at the target. Works as well or better as the converse. I’m a cross-dominant shooter. In my youth, not knowing any better, I always used a right-handed rifle left handed. Later I figured out what was happening (I didn’t know I was cross-dominant) and simply learned I could close my left eye, sighting with the right eye. In any case, we are encouraged to practive shooting with either hand, and so it should not be a big problem for anyone, once they’ve had some good practice. Competition shooting, such as IPSC, often involves “weak hand” stages. My only real problem sometime arises in snap shooting such as upland bird hunting. I might try to use the left eye to sight the bead with the bird while I’m shooting right-handed. that of course resulkts in a miss. If I remember to close my left eye it’s not so much an issue, but I prefer shooting with both eyes open. With the bird hunting I’m actually better off ignoring the sight, and “point shooting” instead. It’s really all about practice. Dot sighted rifles are a breeze either way though. I guess I’m cross-eye dominant, sort of. I’m not “strongly” right handed, though I write that way because writing left handed is easier backward. I am strongly left eye dominant, though, so I fire exclusively left, though I put some practice in right as well. All my firearms are totally right handed; I don’t even have mag releases reversed. I do appreciate the brass block on an AR upper, though, my first shot without one left me a red circle on my neck. I find I have a particular advantage on a bolt rifle; I can clear a ten round mag from my 2A Ishi Enfield in about fifteen seconds left handed, with a pretty good group for speed. Takes more than twenty right handed. Don’t let ’em tell you Lee Harvey Oswald (a leftie) couldn’t squeeze off three aimed shots in six seconds. Light tone was picked so that the rifle wouldn’t heat up in the sun. Just as a black body is a more efficient collector, so too is it a more efficient radiator. I suppose it depends on the weather and one’s wishes. The Carbine-length stock is a nice touch even for a bigger person, for me at least, makes an AR handle and feel a lot more like the AK’s I am accustomed to. My daughters would love that. Can you give a parts list? I can’t be the only one that wants to replicate what you’ve done…. I also built an even lighter rifle that has standard forend and sling swivel for even lighter weight. Thanks Oleg. This info saves much time. The ladies will appreciate it. 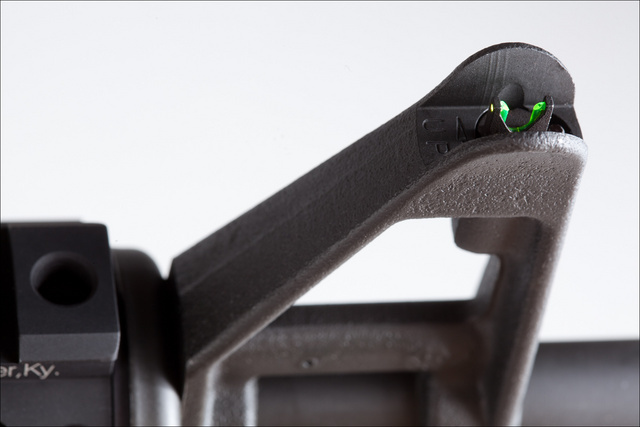 Those stocks are wonderful, and add the option of a side canted dot if you run a scope up top. Very nice. What sort of sight post is that up front? Very cool rifle. Looks like it will serve its purpose well. I think the point of the light weight barrel profile is note worthy but I also believe it is a non issue. People seem to forget that the original M16 series (M16/XM16E1/M16A1) in the jungles of Vietnam used the very same barrel width we call “light weight” now a days.